After their last visit to Jakarta in 2013, VIXX finally met their Indonesian fans again 4 years later through their fan meeting tour schedule in South East Asia. Even if you weren’t fan of VIXX, they surely always have this special place in our hearts because of their constant surprise while delivering various concepts in each comeback. Their latest aesthetic comeback of 도원경 (Shangri-La), left everyone in awe due to the beauty of each art they dropped for the album & stages. 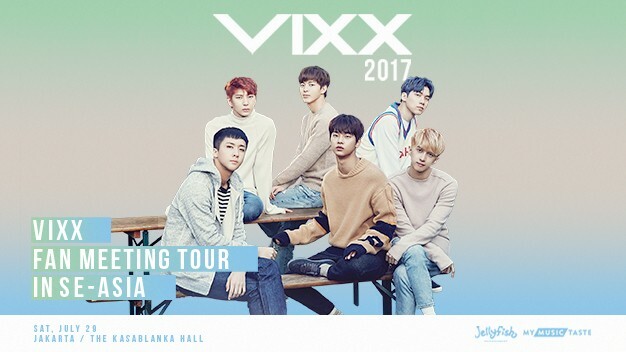 With that, seeing VIXX live on stage must at least once be every K-Pop fan’s dream and ours has been fulfilled on the night of July 29th with “VIXX Fan Meeting in Jakarta 2017” which was held at The Hall, Kota Kasablanka, Jakarta. The show was opened by “On and On”, one of their earlier songs, stage and the stage was directly continued with “Hyde” and “Eternity”. The boys took time to have breath by greeting their fans who have been waiting for them to come again to the city. They then continued to perform more songs before they started Q&A session where they answered and/or fulfilled request by fans, starting from asking Hyuk to sing Ed Sheeran’s song, to asking members questions that they are curious about. Song performances were brought back to stage from slower ones like “Someday” and “Now We” to their latest ones such as “Shangri-La” and “Black Out”. They then took a break with a special corner “Made by VIXX” where they specially made fans, inspired by their “Shangri-La” concept, to give to lucky chosen fans. In the end of the corner, after they took turns on showing off their self-made fans, VIXX said their last words to close the night. They all agreed on thanking fans who constantly ask promoter to bring VIXX back to Indonesia because thanks to them, VIXX could come back to Indonesia. All VIXX members said their gratitude for fans who have been supporting them all along, and asked to continue to do so in the future. After the last greetings, VIXX were getting ready again to perform their last songs. They ended the stage with “Voodoo Doll” and left the stage & fans in awed for wanting for more. After some ‘blackout’ time, VIXX members got back on stage with different outfits, bringing more fun songs, “Heaven” and “Love Equation”, to actually wrapped up the show. As we have predicted even before the show, VIXX unarguably one of groups that won’t fail to make you fall into their stages. Their performances were wonderful and it was complete because they were at their best styles (this is purely biased comment haha) last night. Most people have agreed that VIXX and their outfits are match made in heaven because that was the other point that completed the package for us. Watching their live videos have always been blessed, but it was beyond that to seeing it live with our eyes, so even if you weren’t fan we highly recommend you to take a look to their live stage if you ever had the chance to! The event was neatly organized, but the lack of additional screens for fans in the back was kind of bothering us last night as it was hard for people at the back to enjoy the stage fully because we mostly see the boys in shadows because of the distance. Nonetheless, it was an amazing night and we were amazed at how the boys can packed 16 performances into about 2 hours show while still could talking with the fans once in a while. Below are the list of songs that VIXX brought last night and for more detailed live report you can check our Twitter @KoreanUpdates under #VIXXinJKT #VIXXinSEA.